Intel's original Ultrabook concept referred to ultraportable, ultraslim Windows laptops with a premium design and strict constraints on thickness and specs. But these days, vendors seem to label every semislim ultraportable they sell as an Ultrabook, and Intel has stretched the definition to include laptops that aren't in the same aesthetic league. The Dell Inspiron 14z is a case in point: It's nice laptop--but it isn't an Ultrabook. Sure, it makes the thickness cut (barely) at 0.83 inch, and it has a 32GB SSD boot drive for quick startup, but it weighs 4.2 pounds and comes with a tray-loading DVD-RW drive. This laptop reminds me of the Samsung Series 5 Ultra, another very portable laptop that doesn't walk, swim, or quack like an Ultrabook. Our review model Inspiron 14z, priced at $900, carries a third-generation Intel i5-3317U processor, 8GB of RAM, an AMD Radeon HD 7570M graphics card, a 500GB hard drive spinning at 5400rpm, a tray-loading DVD-RW drive, built-in Wi-FI 802.11a/b/g/n and Bluetooth 4.0, and the 64-bit version of Windows 7 Home Premium. The Inspiron 14z Ultrabook performed well in our WorldBench 7 benchmark test suite, with a score of 120, meaning that it as about 20 percent faster than our reference model, which packs a second-generation Intel i5 processor, 8GB of RAM, and a 1TB hard drive. The 14z also delivered creditable overall performance, as the following chart indicates. 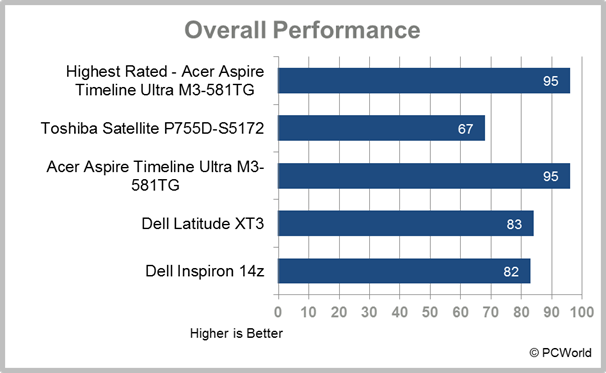 The other three models listed here--the Toshiba Satellite P775D-S5172, the Acer Aspire Timeline Ultra M3-581TG, and the Dell Latitude XT3--are all-purpose laptops, a more natural competitive set for the 14z in view of it heaviness, its optical drive, and its discrete GPU. The Inspiron 14z's discrete GPU raises its gaming capabilities somewhat, and the laptop can even deliver smooth 3D performance. In our Crysis 2 graphics tests, the 14z delivered an acceptable frame rate of 42.1 frames per second (at 800-by-600-pixel resolution and low quality settings). The 14z isn't a match for big-time gamers or graphic designers, but its discrete graphics card offers significantly better performance than you'd get from Ultrabooks that rely on integrated graphics. 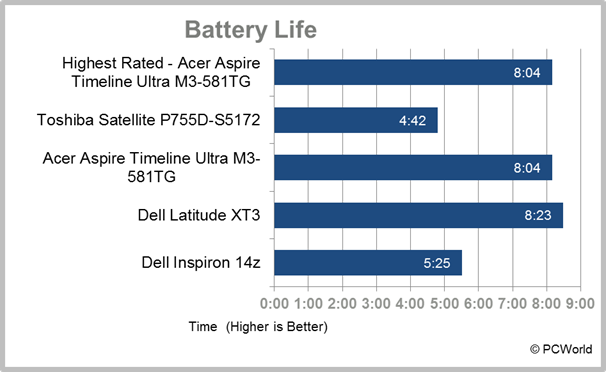 The downside of better multimedia performance is worse battery life: In our tests, the Inspiron 14z managed just 5 hours, 25 minutes of battery life, which is low for an all-purpose laptop but about average for an Ultrabook. The Inspiron 14z is housed in an elementary-looking chassis with lots of rounded corners and matte plastic edging. The cover and the keyboard deck sport brushed aluminum panels, but both are surrounded by matte-silver plastic borders that reduce the sleekness of the design. The 14z's keyboard is spill-proof--and thus perfect for jittery coffee drinkers--but its island-style keys are too small, too widely spaced, and too soft to the touch. In effect, you sacrifice speed and accuracy for quietness. Another shortcoming: The Function keys on our test model worked only about 65 percent of the time. The large, matte trackpad, which is located in the center of the keyboard deck, is accurate but a bit too sensitive. In my tests, the mouse jumped around every time I touched the trackpad. After some acclimation, however, I found the trackpad (which is multitouch-capable) pretty easy to use. The two large discrete mouse buttons on the trackpad are soft and easy to press, but seem a little flimsy. Four buttons are located on the keyboard deck: the power button, a settings button that takes you to Windows Mobility Center, an audio button that opens Dell Audio software, and a programmable hotkey. This Ultrabook offers only two USB ports (though both are USB 3.0), an HDMI port, an ethernet port, and a combination microphone/headphone jack. The ports on the left side of the machine (one of the USB ports, the ethernet port, and the HDMI port) are covered by little flaps, which are mostly just annoying. The Inspiron 14z's glossy 14-inch screen has a native resolution of 1366 by 768 pixels. The screen looks generally good, with bright whites, slightly grayish blacks, and good color representation, but overall it's a little too dim, even at the highest brightness setting in a darkened room. On a more positive note, the range of acceptable viewing angles is pretty impressive, with little darkening or washing out when you move a few feet to either side of the screen. High-definition video playback looks good on the 14z, thanks to the discrete graphics card. Audio quality is solid, though the speakers don't get nearly loud enough. Dell includes special MaxxAudio enhancing software, which works well and achieves clear sound, but doesn't solve the volume problem. Audio through the headphone jack sounds very clean--and if you're near anything noisy, you'll definitely want to wear headphones while working on this computer. The Dell Inspiron 14z Ultrabook is actually a thin, light, general-purpose laptop with Ultrabook aspirations and an optical drive. Thanks to its Ivy Bridge processor, discrete graphics card, and 8GB of RAM, the Inspiron 14z delivers respectable performance, but Dell surrenders style and hardware integrity in the bargain. The Dell Inspiron 14z sacrifices style and hardware integrity for performance.